You must make reservations at least 5 minutes in advance of the time at Woodinville Cut Shop. We've been blessed by the Creator with ample parking-a-plenty. The Woodinville Cut Shop boasts 50 plus parking slots that are wide, spacious and graded special. Perfect for your late '60s land yacht or muscle car. Also pre-designated areas for smokey burnouts and donuts. First Thrusday Honky Tonk night with both types of music, country AND WESTERN. We love to party and can host any type of event your imagination can muster. Hit us up and lets talk it out! The Cut Shop has several discreet areas for private parties. Also entire venue available for rental. The Woodinville Cut Shop is a neighborhood restaurant and lounge dedicated to creating an unequaled experience for our employees, neighbors and customers. We bring a new take on the classic American roadhouse, with a traditional Americana-inspired menu updated for modern tastes and executed from scratch. Our expansive mid-century- inspired roadhouse dining experience offers a restaurant, bar, beer garden featuring a rock waterfall, and a large patio with a fire pit. My friends and I started coming here on Tuesdays for trivia nights and it’s always so great. The food, the staff, everything. It also happens to be half off wine bottle night so that’s a big bonus. We love this place! More like a bar and grill than a serious restaurant. You know when the standard side dish is French fries you are not at a high end restaurant. The strip steak was prepared well but tough. The wine was insipid but they wouldn’t know that because they just dropped it off and left. I asked three times for water and never did get any.. they did give me a credit on my bill. Pretty noisy. Pricey for what you get. The food was OK - nothing terrible, it just didn't blow me away. The service was quite slow. I think they were understaffed, as it looked like our waiter had all the tables on our side. We likely would have had a couple more drinks, but the waiter didn't have a chance to stop. The host was dismissive when I checked in. He didn't look at the reservation, so I got a notice from OpenTable that I missed the reservation, when I was actually there. The tables are close together, so the conversations around you can be loud. I would go again with friends if they wanted to go there, but for myself, it isn't on the top of my list of places to visit again. This is the second visit where we've had bad food. The first time they forgot my food and took a very long time to get it out to me (the restaurant was empty that day, no kidding). This time they forgot my girlfriends food which didn't take incredibly long to get corrected and out waitress was great (same waitress as our first visit), my bun was also a burnt crouton lol. Our table of 4 all got sick shortly after visiting and was brushed off by management as something we had before visiting. Another point to mention; every time we've visited we received dirty water! it may have been clean but a TON of "floaties" either from the glasses or carafe. I am not someone who typically writes reviews and was hoping to find a new hangout spot for low-key burgers and beer but I don't think i'll be back anytime soon. Drinks took a minute, but the rest was awesome. Really refreshing to have a different experience like that. Highly recommend it. Dancing, good food and fun people made a memorable experience. Valentine's Day dinner was killer! Surf and turf, oh yeah! Good crowd. Plastic cups are a turn off. Had a less expensive alternative for LIII day which was nice. Can be too pricey. We love the Cut Shop! Such a fun place. 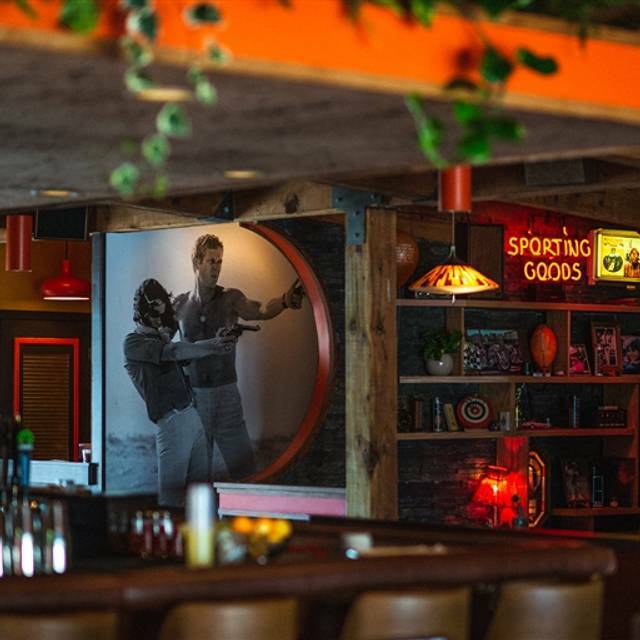 It’s like a roadhouse meets speak easy. Great vibe. Great food. We were seated quickly, and the servers were nice and gave us a heads up that the kitchen was very busy and it may take longer for food. The food didn’t take as long as I expected. Yelp said it was good for kids but it didn’t feel like a family place, it was basically a dim lit bar. Menu was small and they were out of 2 of the things we ordered, and what we did get was not very well made so we didn’t eat much. We left hungry. Enjoyed a nice meal and conversation with a friend who was visiting from out of town. Service was great. We all liked our cocktails and meals. I have been to the cut shop twice, and have enjoyed the food both times. Last time I went for Italian night, but they seemed to be out of most the special items, including Chianti and Tiramisu. It's an interesting place with a lot character, so I'd like to see it do well, but running out of advertised specials at 7pm was disappointing. The live music on Thurs was good. Love the country dancing! Pricey burger, $16?! Came in for lunch on a Sunday afternoon. The restaurant wasn't super busy, but the ambiance was super kitschy and fun and the food was awesome. Service was attentive and helpful without being overbearing (really appreciated them offering some extra au jus to take home w/my leftover French dip). We'll definitely be back! Hoping to try the steak next time. LOVE the 70’s vibe!! Great food! Wish the acoustics were better. Very difficult to have conversation across the table. A little chilly in the room too BUT I will be back!! Food was mediocre at best, over priced. Special was not as described and the price was well over the quality of food. I had high Hope's for this. I'd been looking at the menu online. The food was good, great pretzel, deviled eggs and the grilled cheese was amazing. I guess where it falls short is the communication and preparedness between the kitchen and the staff. We had a 5:30 reservation on a Friday night. I ordered starters right away. (Yum) Then decided on grilled cheese and tomato soup. I even made the remark that this would be a great combo for a chilly fall night. When they brought the food I had a huge pile of fries with my sandwich. Hmmm I didn't order fries. I was then told they were out of tomato soup. If I was told this before I would have ordered something else. I didn't want a greasy cheesy gooey delishiousness of a cheese sandwich with a fried side. I took a half home for later. So on to dessert. Of the two things on the menu they were out of the one I was interested in. I will definitely go back because there are more things I want to try and that has to be one of the best grilled cheese sandwiches ever. The only thing that would have made it better was a cup of tomato soup to balance out the greasy goodness of the sandwich. The food was over cooked for all of our meals. The service wasn’t bad, but it wasn’t spectacular either. I do love the atmosphere and music they play. I wish I had obtained names because they were outstanding. I would return mainly for two reasons. The service and food. The reason for our visit is because my sister and I go out once a month and we like to try new places. 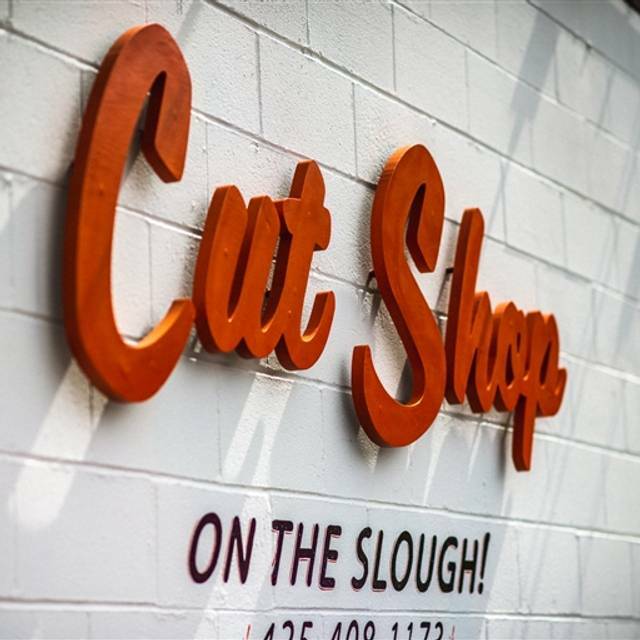 A friend was taking about The Cut Shop on the Slough (Woodinville) so we decided to give it a go. Good decision. Everything was great. Thank you. Amazing atmosphere, but menu was very limited and what we had, burger and steak, was quite average. Good bar food, limited amount of beers on tap. Wings were good, fettuccine was too salty. Great atmosphere and fun drinks. Food was simple but clean and good. Very accommodating! They let us decorate the table for a Birthday, served amazing tasting food, had a great band for dancing! Loved our experience! This was a hugely disappointing experience. We were kept waiting at the front door for close to 5 mins as there was no one there to greet us. Then when we were eventually taken to our table we had to wait another 5 mins since the table wasn't ready and had to be wiped down. Our appetizers took close to 45 mins to materialize and were sub-par. $15 for two small scallops. Seriously? Then our main courses arrived a few minutes later before we were even half way through our starters. The rack of ribs was horribly cooked and burnt to a char completely on the underside. The fries also had way too much salt on them. When we left around half our food was uneaten. We paid over $150 for this meal for five and left hungry. And the lack of a functional lock on the men's bathroom door was also the icing on the cake. How does a place that was refurbished a few months ago not have functional bathroom doors? Avoid this place at all cost. You will regret eating here. Overall this place was a great place to relax and get a real good mid week meal when you don't feel like cooking. We have been here 2 times before and enjoyed the food. Tonight was a serious disappointment. There was a reduced menu and they were out of many items. The drinks were great. The steak was missing the sauce and the server did not even know that my husband ordered the steak and not just a side salad. Finally at the end of the meal the server mentioned that the chef was changing. So frustrating. We took our teenage kids and Grandma to this amazing restaurant for a fun evening. We relived our 70's experiences with the decor and music. The crab cake is a must; also try the chicken and dumplings, rib eye, and mushroom stroganoff. Make sure to save room for dessert. We opted for sharing the three sweet offerings - best way to go! The dinner was fabulous - we had a great time - our server was great - but she disappeared toward the end of our meal and we had to go find someone to pay our check. We were outside so someone else could have walked off. 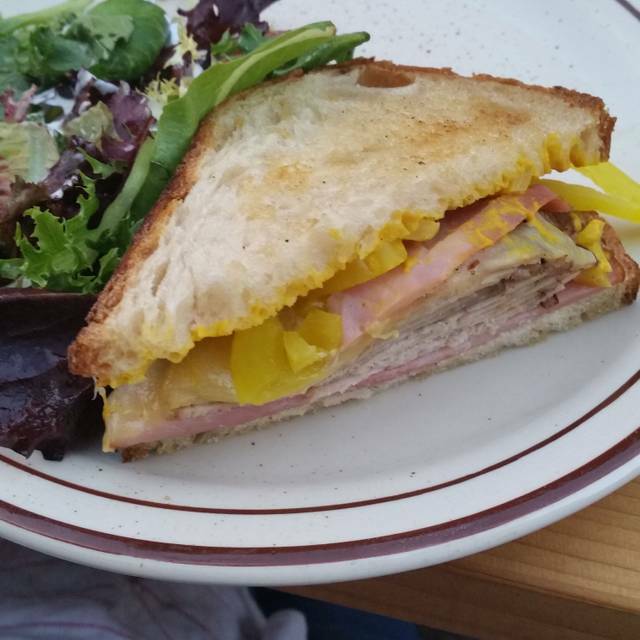 Love the casual vibe, food and service were solid but not quite as good as our first visit. However, we like the atmosphere so much and how relaxed it is that we will go back. May want to expand menu slightly but good starting point for a new place. When you walk in and the waiter asks you if you prefer tap or sparkling water - take the tap water, unless you're into seeing charges of $6 per bottle (! ), which you thought was complimentary, on your final check. If the waiter tells you that they can't take your order because the kitchen is backed up, do yourself a favor and go eat some where else, unless you're into sitting there for an hour waiting, sipping over priced water. That being said, the food was good and the team seemed to have good intentions. It's just that we're not fans of nickel and diming, so we'll not return. Nice new place for Woodinville. The outside isn't quite done the view from the patio is construction dumpsters. Love the menu (pork chop was outrageous), service and kitschy interior. Needs some sound dampening. Menu was too limited, and an odd mix of choices.